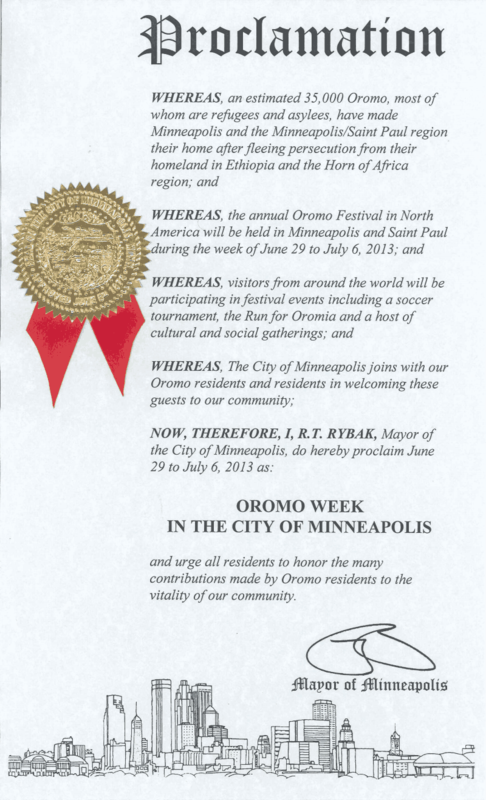 (OPride) – In recognition of Oromos growing importance to their community, mayors of Minnesota’s Twin Cities on Thursday proclaimed the week of June 29 to July 6, 2013 as “Oromo Week” in Minneapolis and Saint Paul. 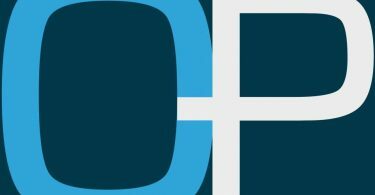 “An estimated 35,000 Oromo, most of whom refugee and asylees, have made Minneapolis and the Minneapolis/Saint Paul region their home, after fleeing persecution in their homeland,” Minneapolis Mayor R.T. Rybak wrote in a proclamation document given to leaders of the Oromo Community of Minnesota (OCM). Rybak urged his residents to accord a warm welcome to guests coming from around the world to participate in the Annual Oromo Festival in North America during the week. 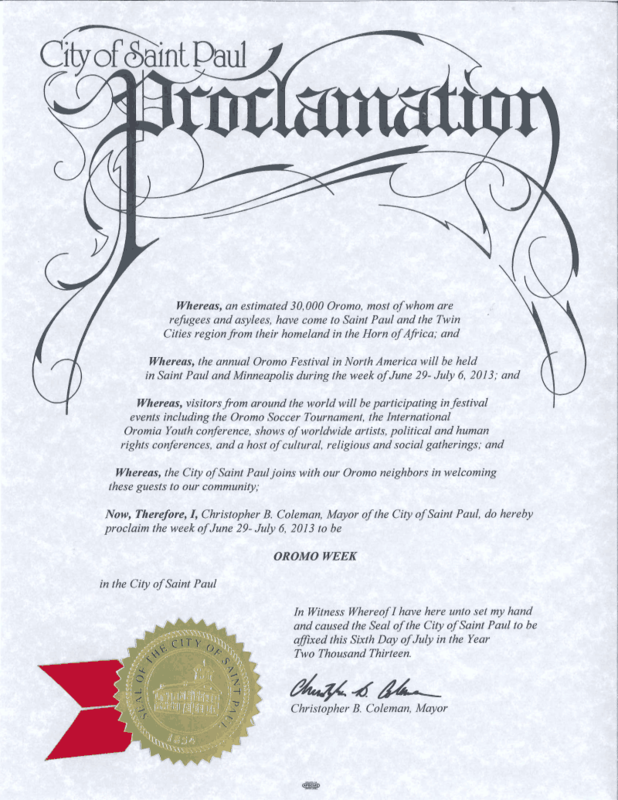 “Visitors from around the world will be participating in festival events including the Oromo Soccer Tournament, the International Oromia Youth conference, shows of worldwide artists, political and human rights conferences, and a host of cultural, religious and social gatherings,’” wrote Mayor Chris Coleman of Saint Paul in a similarly worded proclamation. Both Mayors underscored the contribution of Oromo expats to the vitality of their respective cities and the state of Minnesota as a whole. 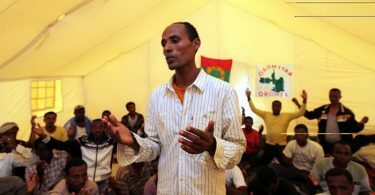 Unofficially known as Little Oromia, Minnesota is home to the largest number of Oromo immigrants outside of the Horn of Africa. The Oromo are Ethiopia’s single largest ethno-national group, estimated at 40 million. According to estimates by Oromo Studies Association, there are currently over 150, 000 Oromos living in the United States. The 17th annual Oromo Soccer Tournament organized by Oromo Sport Federation in North America (OSFNA) is scheduled to tip off at at Washburn High School in south Minneapolis this saturday. Founded in 1995 as a non-profit, OSFNA promotes sports and cultural events within Oromo communities in North America through annual soccer matches. Minnesota fields the largest share of teams who will clash all week for the golden trophy. This year’s Oromo Festival is being accentuated by two historic coincidences. First, for thirteen years, OCM has organized its signature event of the year: the Oromo Picnic. This year’s Oromo picnic is expected to be even more memorable and colorful by attracting a much larger crowd from visitors already in town for the soccer tournaments. Began in 2000, Oromo picnic is an iconic social gathering of Oromo Minnesotans filled with a lot of excitement, food, friendship, sports, and jubilant independence. 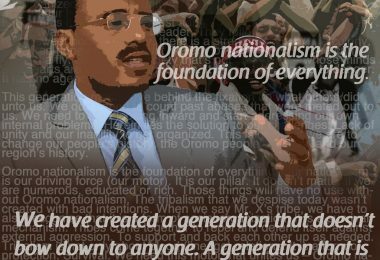 “The sea of Oromos in all their diversity roaming the Riverside Park in Minneapolis on this day had the look of a people perfectly at home, confident and every bit as devoutly patriotic Americans as anyone could possibly get, not to mention passionately Oromo,” Ademo observed in 2010. 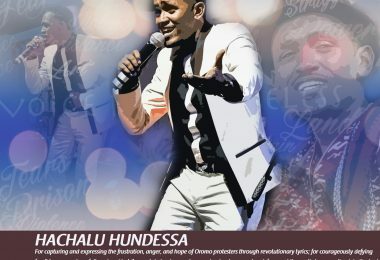 Second, on fourth of July night, Oromo expats from around the world will gather to pay homage to a true Oromo musical legend, Dr. Ali Mohamed Birra. Ali Birra’s Golden Jubileeis expected to feature prominent scholars who will reflect on his 50 years of musical career, release of a book about Dr. Birra’s life, and a star-studded concert.